Guy Harvey, left, and SeaWorld CEO Joel Manby announce the new partnership in Orlando, Florida last week. 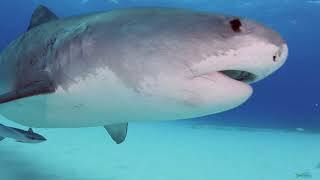 In a new partnership, Guy Harvey is teaming up with SeaWorld Parks & Entertainment to work on raising awareness and doing research on shark conservation. The Guy Harvey Research Institute estimates that almost 100 million sharks are killed each year, with an estimated 73 million killed for the trade in shark fins.